When it comes to food, I just can’t seem to sacrifice the best for them. The best piece of steak would be gobbled down and not appreciated for it’s flavor by a 4 year old. My 9 year old is only concerned with how much he can get into his mouth in the shortest amount of time… he barely even tastes what he puts in there. Why am I sharing this with you today? Because when it comes to doughnut holes from our favorite Daylight Donuts shop up the road, I always peer into each bag before handing them out and save the best of the best for myself. The doughnut holes that are perfectly cooked… not too done, still warm, and soft and fluffy. Most mom’s would probably give those to their kids, taking the doughnut holes that aren’t as stellar. But, I’m selfish and if I am going to spend any calories on doughnuts, those little gems need to be the best of the best to make it worth it! My kids and I decided to make Homemade Yeast Doughnuts and doughnut holes this past weekend. They helped with cutting the dough and dunking the doughnuts into the glaze. Luckily, almost every single doughnut was the best of the best, so I didn’t have to be selfish mama. 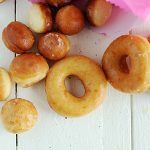 We could all enjoy soft, tender, warm doughnuts and doughnut holes without my inner struggle regarding my un-willingness to sacrifice the best doughnut holes for my kids. Place the first 8 ingredients into your bread machine in the order recommended in the users manual (Mine suggests all liquid first, sugars next, flour and yeast last). Turn on and set to dough cycle setting. Once the dough cycle is complete, turn the dough out onto a floured surface and roll out to 1/2 inch thickness. Using a floured doughnut / biscuit cutter, cut into desired shapes. Heat oil in a deep-fryer or large heavy skillet to 350 degrees F (175 degrees C). Slide doughnuts into the hot oil using a wide spatula. Turn doughnuts over as they rise to the surface. Fry doughnuts on each side until golden brown. Remove from hot oil, to drain on a wire rack. Dip doughnuts into the glaze while still hot, and set onto wire racks to drain off excess. Oooh! Delightful. Homemade pasta and now homemade doughnuts? That’s it. I’m moving in. Amy we can share a room…….I’m moving in to Kristen’s too!! I am so making these – all for me! I think moms should get to be a little selfish every once in a while, go ahead enjoy the best doughnut holes, you deserve it! Such a cute post – love your honesty here! I agree – if you are going to spend the calories on a doughnut, it should be an awesome donut and these look fantastic. They look better than any doughnut I’ve ever eaten from a doughnut shop. Doughnut holes are my absolute favorite! This will have to go into my “things to do with my kids” pinterest board. Kristen, I am so impressed! These doughnuts look as if they came from a bakery. Come teach my class how to do these. They look so yummy! These look fantastic. I can understand why you save some for yourself. I like your combination of ingredients for the glaze. Gotta give it a try! Did you know donuts are my all time favorite food?? These look AMAZING AMAZING AMAZING. We also have a Daylight Donuts in town…best donuts ever. But these look better!! I want some. NOW. I’m not sure I’d have the willpower to stay away from these while on WW. This from the girl who is making pancakes for breakfast this AM. Daily struggle. Food is too good, isn’t it?? These look like some great donuts. I don’t blame you one little bit! Too many moms always put the kids first. Moms need to come first in their own lives at least some of the time, and ESPECIALLY when it comes to something like fresh donut holes! YUM!! I always say I will share anything EXCEPT my food… lol. And of course, you make some good points about kids not really knowing how to appreciate some foods! Donuts is something we have been wanting to make but they always seem so….annoying? (with the frying and all) You’ve inspired me to give it a try. I’m adding these to my “things I can make from the dough cycle on my bread machine”. I’ve been obsessed lately with it and these are perfect. Fun post! Wow, your doughnuts look incredible! I can’t wait to try these! 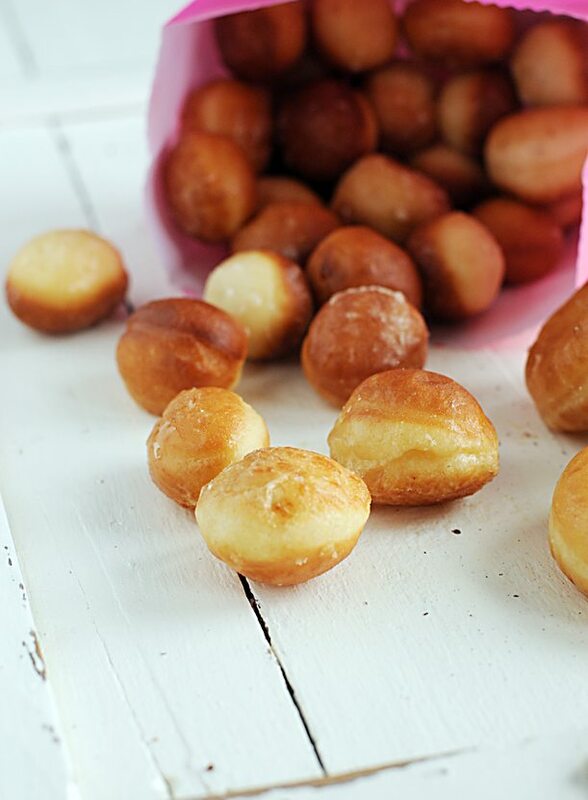 I am a sucker for doughnut holes…I love that this recipe can be made in a bread maker. One day I’ll invest in a fryer, which seems much easier than doing it on the stove top. Lovely photos! I’m definitely partial to the doughnut holes, but honestly, your doughnuts look so good that I’d happily have whatever you could spare! These look so tempting! You are a great momma! Donuts are Little Buddy’s weakness. I really should make them with him soon. You are my inspiration! My daughter Sassafras loves, I mean LOVES doughnuts. I got her a doughnut pan and doughnut mix for Christmas just so I wouldn’t be badgered by her to go get doughnuts every Saturday (me selfish mama too). We have now used up all of the doughnut mix so your timing is splendid! I shall pass this on to Sassafras a.s.a.p.! I’m right there with you!! Even though Abbi is only 2, she’s notorious for wanting to eat whatever I’m eating. I’ll save things until she goes to bed or is occupied in another room! These doughnuts look absolutely perfect! I get indigestion just watching my ten year old son eat! What is up with that? Is it the age? Anyway…do I have to buy another appliance? Your doughnuts look so perfect that I feel as though I need a bread machine. Your cooking project with the kids is a good one. Btw, you’re being featured in frugalrecipesdaily . Cool to see how connected everything is . Pretzels, pasta, now doughnuts. 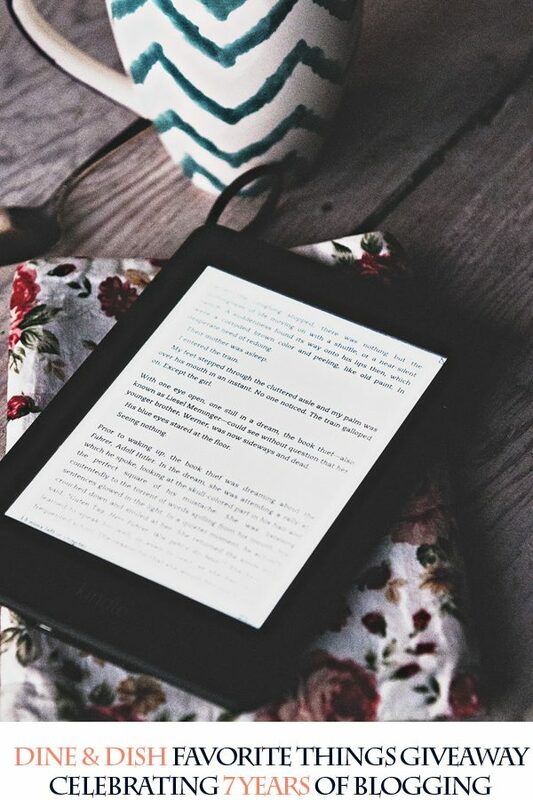 I’m getting fat just reading. Yum. Help! These look wonderful, and amazing timing too–my little guy was just asking if we could make doughnuts, “you do know how to make doughnuts, don’t you Mommy?” Now I do! Except. . . I don’t have a bread machine 🙁 Can anyone tell me what to do to achieve “set to dough cycle setting”? Do I let it rise –once? twice? Thanks for the help, and Thank You for the recipe! was on the farm this weekend and had homemade doughnuts. tough call, the doughnuts or the cinnamon rolls … had to eat plenty of both to decide which was better! when folks think about hawai’i, it’s usually the beach, the sun, and the waves that come to mind. but what I miss most about living there are the malasadas, doughnuts fried up on the side of the road sold from carts and trailers. you’d go for a saturday morning bike ride and grap a bag on the way home. mmmm, mmmm, mmmm. 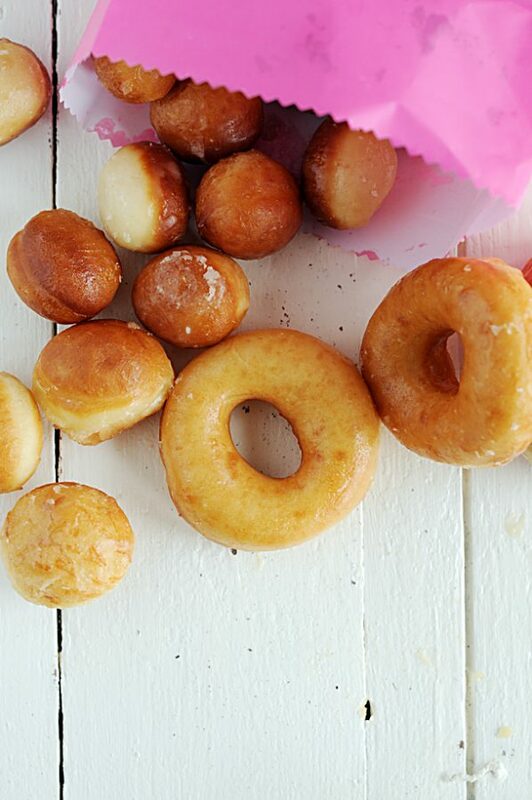 Love all these wonderful doughnut recipes that are exploding all over the blogworld recently! Yours look absolutely delicious! 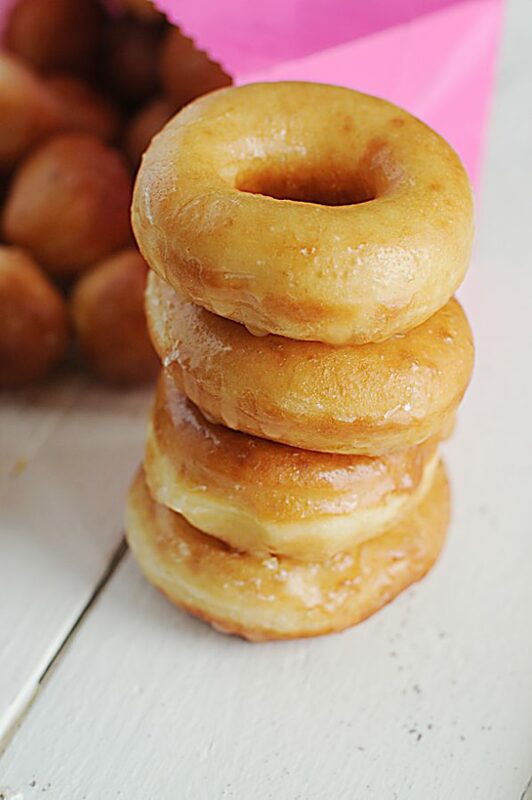 Sounds yummy – do you let the doughnuts rise after cutting to shape and before frying? i look at this situation as being selfless – really Kristen, think about it . . . you’re saving your children from the calories, from the sugar, from having to run on a treadmill to get rid of all that sugar and calories . . . yep, i’m seeing this as a very, very selfless act . . . in fact, i vote you mother of the year!!! I’ll give this a try! I made one previously that I didn’t fancy because it turned out too rich, too much butter and eggs. Yours look promising! Thanks for sharing! This brings back so many fun memories of making donuts with my mom and sisters. So why haven’t I done this with MY girls yet?! Yours look completely delicious – they’re beautiful! I just love making donuts. Each year on Christmas day we make them this way, frying. Sooooooo good. I love that the dough is made in a bread machine. It makes it so much easier! Thanks for sharing your thoughts on quesadilla maker instructions. The clearness on your submit is just cool and i can suppose you’re knowledgeable on this subject. Just finished making these for our Christmas morning treat. They were everything you said and more. 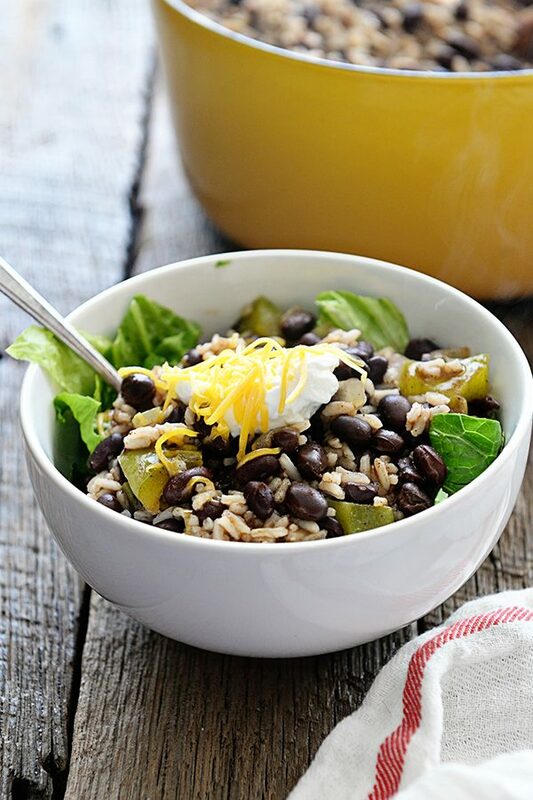 Thank you for posting and sharing the recipe!!! I remember when you used to make canned biscuit donuts at home….and once in a while I would come home to smoked ceramic tile behind the stove where the oil got a wee bit too hot and caught on fire…The soda box was in the cabinet to the left of the stove. Anyway, practice makes perfect and your donuts look like perfection! Just made these today — possibly the best doughnuts that I’ve ever had. Thanks!